According to manufacturer Krtkl, "if you're serious about doing anything that involves robots, drones, computer vision, or automation, you need snickerdoodle." 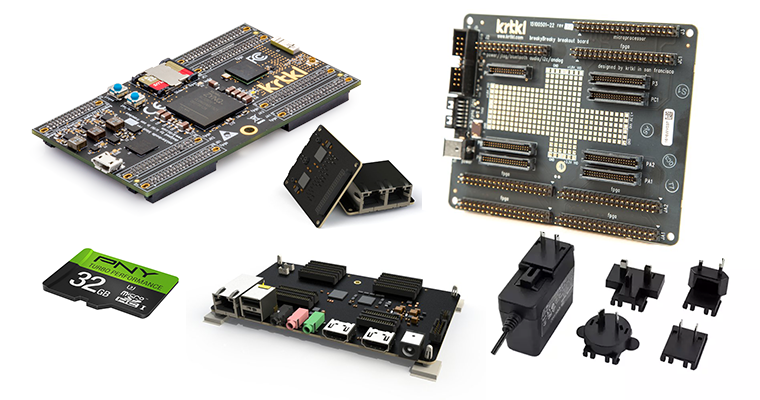 It's designed to be a step-up from the likes of the Raspberry Pi, and to make the giveaway that little bit sweeter we have an entire bundle containing a snickerdoodle black, breakyBreaky, piSmasher, giggleBits, a 12V/36W wall wart and one 32GB pre-loaded SD card! The competition winner will be picked at random from all eligible entries that arrive by 22:00 GMT on the closing date, January 6, 2017. The winners will be notified via email by January 13, 2017. The winner must claim their prize within 7 days of the promoter sending notification. If the prize is unclaimed after this time, HEXUS reserves the right to offer the unclaimed prize to a substitute winner selected in accordance with these rules. The prize is a Krktl bundle comprised of one snickerdoodle black, one breakyBreaky, one piSmasher, one giggleBits, one 12V/36W wall wart and one 32GB pre-loaded SD card. Time to make that robotic arm massager I've been promising myself. A nice step up from the Rasberry Pi and to top it off, you have included a bundle to really help get this up and running.